The Greenworks 40V Cordless Lawn Mower 14″ is one of the best selling cordless lawn mowers in the US, but is it all what it’s cracked up to be? The Greenworks Mower is indeed packed with features you would expect to see in higher end cordless mowers and certainly has the ability to cut a lawn in excess of 2690 square feet (roughly the size of a tennis court) , but it needs to be compared to it’s nearest rival, the Flymo Mighti-Mo 300 40V Lithium, to judge how good this mower really is. 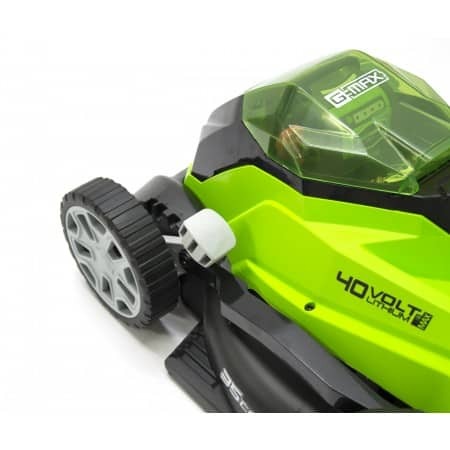 To compare Greenworks 40V to other cordless mowers in higher or lower price range would distort the results, these two mowers are probably the most affordable and best performing 40v cordless mowers on the market today. 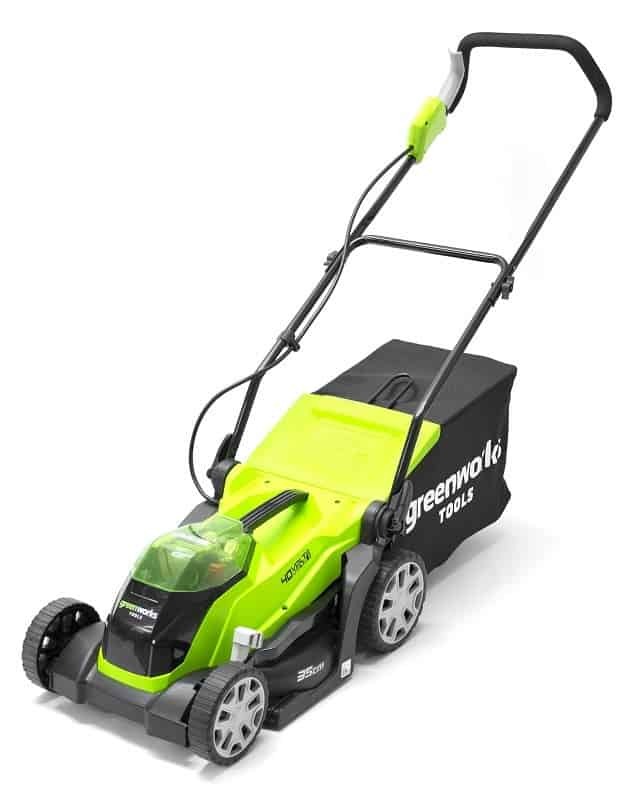 Below I’ll be detailing all the features and functions of the Greenworks 40V, both good and not so good and then comparing to the Flymo Mighti-Mo 300 40V so you understand exactly what you’re getting for your money. 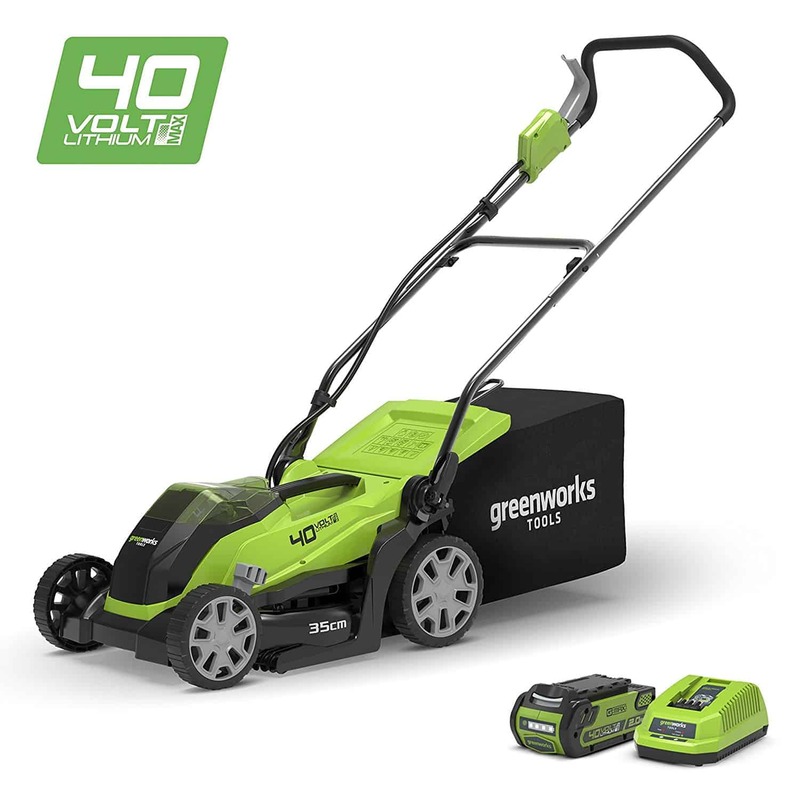 Like many cordless lawn mowers, the Greenworks 40V is powered by a Lithium-ion battery (40V) and electrical motor which it will charge in around 120min. The battery is removed from the mower for charging and storage. When purchasing this mower there is an option for a second battery. This is only really required if you have a larger lawn (over 2690 square feet), then you will need to switch the batteries during mowing. This is very quick and easy with all Greenworks mowers. 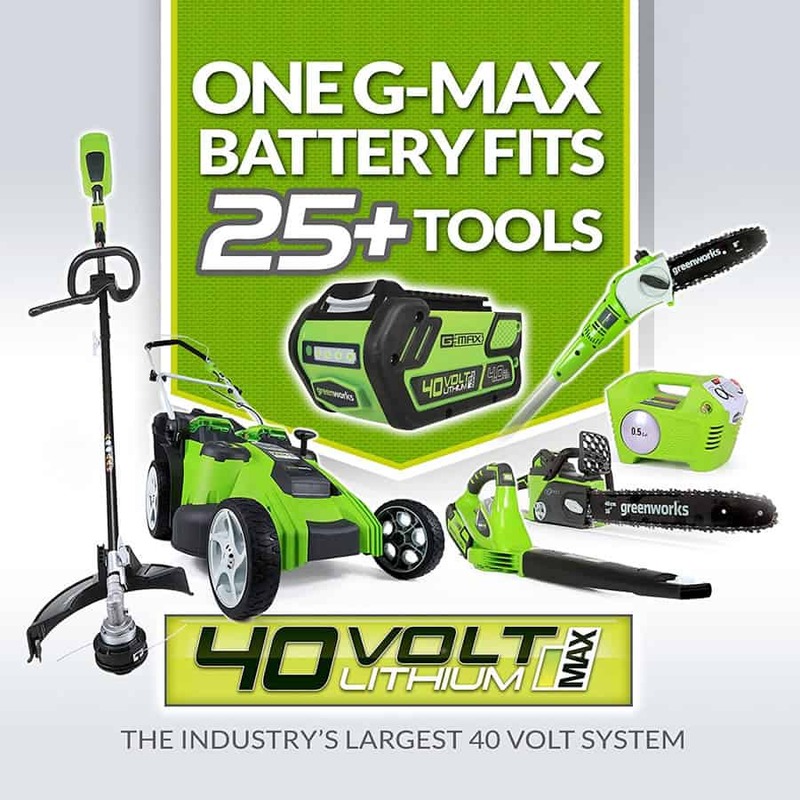 The Greenworks G-MAX 40V 4Ah battery and charger supplied with this mower are compatible with all the Greenworks G-Max 40V tools and will run your Greenworks G-Max 40V hedge cutter, chainsaw, trimmer, cultivator and leaf blower. Something else that’s nice on this mower is an easy to see and read battery level indicator; you would this this is standard on all cordless mowers, but isn’t. 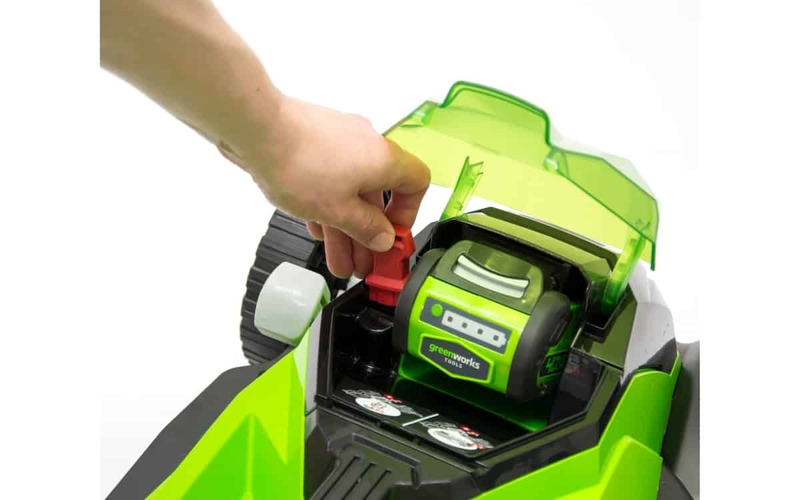 With both mowers, only one battery can be charged at any time. I also found that the charger with the Flymo will not allow the battery to be recharged immediately after being used and needs a considerable period of time (40min) to allow the battery to cool down, so bare this in mind when comparing charging times. Also, the power system is completely electric so it produces zero emissions and works extremely quietly. Which is quieter? well there’s not much between them but would say the Flymo is slightly quieter than the Greenworks, but really there is nothing in it that you would notice. The Greenworks 40V Mower has a 14 inch cutting width with a single rotary blade that provide the following benefits. The blade allows for a wide 14 inch cutting width right to the edge of the mower. 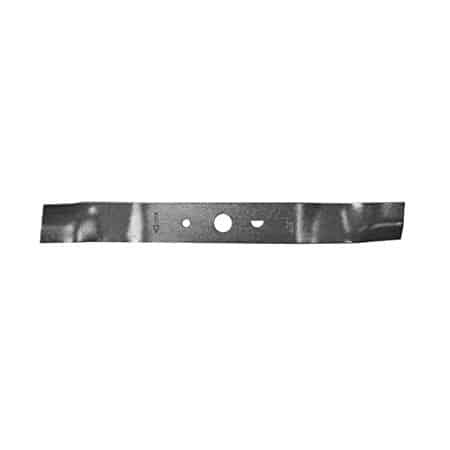 Metal blades are generally sharper and provide a cleaner cut to the grass blade, resulting in a neater, tidier and superior finish to your lawn and yard. The metal blades on the Greenworks 40V can be sharpened when needed unlike plastic blades. This again does put it ahead of competitors and it’s good that Greenworks have taken advantage of what is clearly the most effective cutting system in the market. So in summary, this mower cuts extremely well whether or not you are collecting the clippings or mulching. Oh yes I forgot to mention this mower also has the option to mulch the cuttings. In order to combat the changing season and to continually improve the look of your lawn, you can adjust the height at which the Greenworks 40V Cordless Lawn Mower cuts at. This is done very easily using the large single lever located on the front of the mower. Now normally we would say that a front adjusting lever is always harder than a centrally located lever, but on this occasion the adjustment on the Greenworks is just a easy. I think this is achieved by a linking arm to the rear wheels which make the adjustment very smooth with very little effort in both directions. 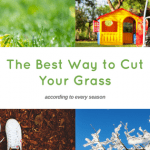 It lets you choose to cut from anywhere between 1-1/4 inch to 3-3/8-inch with 5 separate cutting lengths, this allows a lower and higher cut when compared to the Flymo. 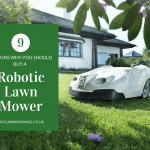 Just make sure you don’t set it at the shortest setting from the when the lawn has significant growth, instead start at a much higher setting and gradually work your way down. 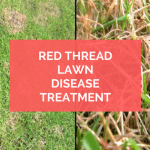 This gives the areas of small grass to catch up with the long, resulting in a more even yard. The Greenworks Cordless mowers come in the following deck diameter sizes. This range makes it easy for you to get the width that is best for you lawns shape and size. 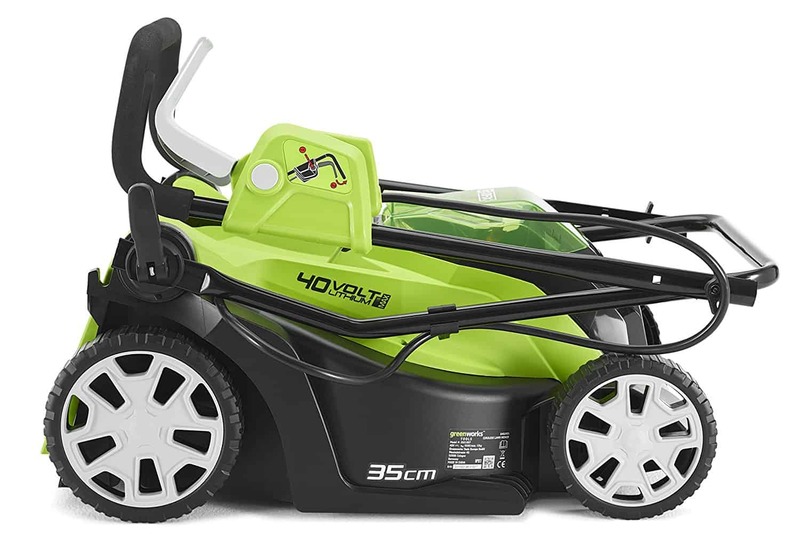 The cutting diameter of the mower is by no means the largest 14”, but it is perfect for those with narrow strips to navigate, this is very slightly larger than the Flymo but still small enough to manoeuvre around the tricky areas of your lawn. 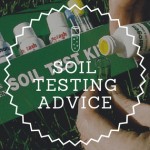 Now, compared to it’s counterparts with much larger widths, this might be a potential disadvantage; however, it could also be beneficial if it’s to be used in a smaller areas and lawns with narrow strips. You may well be thinking that for a mower with slightly larger width you would have to compromise on having a heavy and difficult to manoeuvre mower, well that’s not the case with the Greenworks as it is one of the lightest mowers in this class and size range and weighs up to 30-40 lbs lighter than a gas/petrol mower – WOW!. 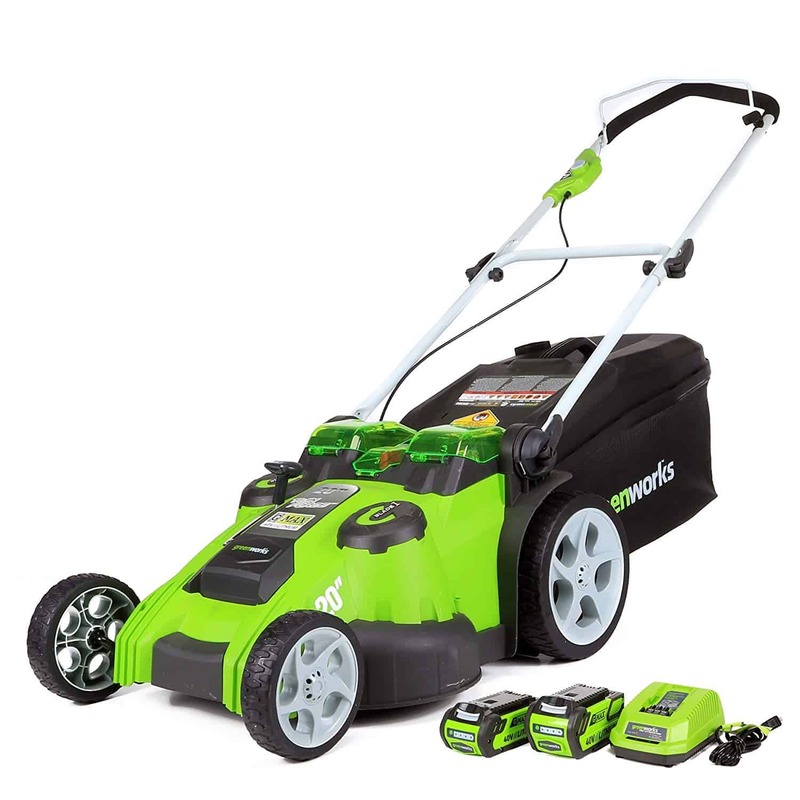 When you need a mower that’s light in weight and going to get your lawn mowed in the shortest time possible, this may well be the best option, the Greenworks could be the cordless mower of choice. As with all cordless lawn mowers of this size, the grass box is not going to hold as much as its larger counterparts, however 13 gallons is a little larger than the Flymo at 10 gallons so will still allow fora little longer period of use without needing to empty grass clipping as often. The grass box on the Greenworks is very easy to remove and the grass clipping empty from the box with no obstructions. An airflow tab located on the bag tells you when the bag is full, eliminating any guesswork about when it needs emptying. 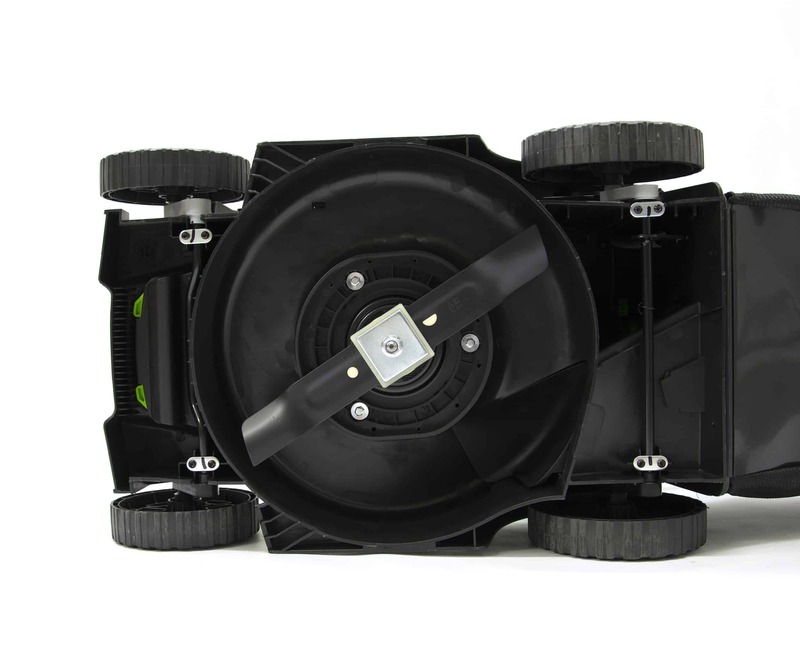 The light weight, oversized wheels (7″ rear wheels, 6″ front wheels) and the smaller cutting width make this mower excellent for smaller lawns or lawns with slopes or are uneven. This really will make lawn care much easier and really makes the entire experience much less dependent on you struggling with a heavy over sized gas mower. As with all cordless lawn mowers, not being tethered by the cord not only makes it easier to mow the lawn, but safer, quieter and more environmentally friendly. Does this make it more practical the it’s closest competition? well, yes I think it does for people with smaller lawns with obstacles that don’t have a need for longer running/mowing time. 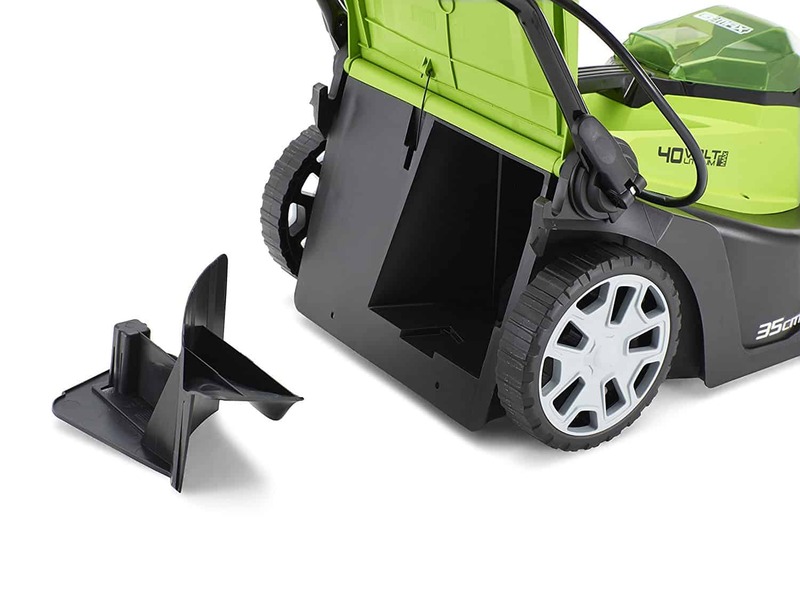 There is also a fold away handle that makes carrying and storing the mower in the garage or shed very easy. Like a stripey lawn? Well sorry the Greenworks Lawnmower does NOT have a roller at the rear. If you simply have to have a stripey lawn then you can either purchase a separate roller or you may want to consider the Flymo 300 as it does have a rear roller. What I really like about the Greenworks mower is the addition of a removable safety key that disables the lawnmower to help prevent accidental starting. This is a nice feature not found on similar cordless mowers that give peace of mind around children. As with almost all Greenworks electric corded and cordless versions are capable of mulching. The Greenworks seems to do this very well due it its metal blade that produces a fine and very small mulch. Want to know what mulching is and the advantages, then click here. You can view or download the manual for this cordless mower by clicking the link below. This mower does not have a roller at the rear so no stripy lawn. This mower is not self propelled – but it is really light enough that it doesn’t matter so much. You can only charge one battery at a time, so a second charger may be required if you have an additional battery. This mower can struggles in a really dense grass areas. Be prepared to make more passes in such a condition, however, this is a problem most cordless mowers experience. Overall this is a very good mower, I actually rate it very slightly higher than the Flymo Mighti-Mo 300 Lawnmower due to it’s portability and good build quality and slightly larger deck and faster charge time. The Greenworks 40V is very proficient at cutting varying lengths and thickness for such a lightweight cordless mower. It’s worth mentioning that by cutting more regularly and avoiding very long or wet grass this should avoid not putting too much strain on the battery. Remember to always keep the battery charged and in a dry place over winter. With this mower you’re getting features normally found in high priced gas/petrol mowers, so this is a very reasonable price. At this price range this really gives great value for money and you would be very hard pressed to find a cordless mower that performs this well, and has such a good build quality for this price. 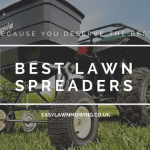 To get the best out of this mower you will need to cut your lawn more regularly and not let the grass grow too high or dense as it may struggle to cut very dense grass, this is however common with all cordless mowers at this price point and specification. Overall I think this is a fantastic mower and I encourage everyone with a lawn no larger than 300 m² yard to purchase one. Even if you have a larger lawn there is always the option of purchasing the mower with an additional battery or you could always purchase an additional battery at a later date if needed. Greenworks is really getting a name for itself and proving to be a reliable and cost effective brand. In fact I think it’s the best mower at this level you can get right now! Well there are a few factors to consider first, whether or not you purchase this model really depends on your yard and situation. Their yard is less than 2690 square feet in size if you don’t want to be switching batteries. Below are some questions I get asked about this mower and cordless mowers in general. Please feel free to contact me at mark@easylawnmowing.com if you have any further questions or need some advice. Is this mower self propelled? No – Its lightweight so not necessary. What is the warranty period for the G-Max? The mower has a two year warranty. What batteries come with this mower? Does the Greenworks give a nice even cut or do you have to mow the same area over again? It gives a very good cut and is great at mulching. What’s the run time on a fully charged battery? Depends on how tall and thick your grass is. An average mow will give you a maximum of 35 minutes battery life. Does the mower come fully assembled? Amazon send it almost assembled. You’ve just got to assemble the handle and charge the battery. What size bladed does the mower take? No, not adjustable but it does fold for storage. Do you have to remove the batteries to charge them? Does the mower come with a charger? Yes the charger is supplied. Amazon have the best prices that are difficult to match and probably the most reliable delivery system on the web. Considering how valuable this piece of equipment is you want the most for your money and the best service possible making Amazon the best place to go.